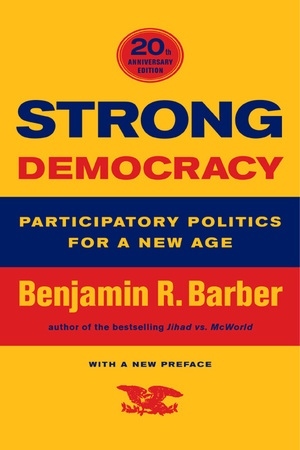 Since its appearance twenty years ago, Benjamin R. Barber's Strong Democracy has been one of the primary standards against which political science thinking and writing is measured. Defined as the participation of all of the people in at least some aspects of self-government at least some of the time, Strong Democracy offers liberal society a new way of thinking about and of practicing democracy. Contrary to the commonly held view that an excess of democracy can undo liberal institutions, Barber argues that an excess of liberalism has undermined our democratic institutions and brought about the set of crises we still find ourselves struggling against: cynicism about voting, alienation, privatization, and the growing paralysis of public institutions. In a new preface Barber looks at the past twenty years and restates his argument, which seems, sadly, more pressing than ever. Benjamin R. Barber was Kekst Professor of Civil Society at the University of Maryland and Director of the New York office of The Democracy Collaborative. He is the author of Fear's Empire: Terrorism, War and Democracy (2003) and Jihad vs. McWorld: How Globalism and Tribalism Are Reshaping the World (1995).